How many planets are in our galaxy? Billions and billions of them at least. That’s the conclusion of a new study by astronomers at the California Institute of Technology, which provides yet more evidence that planetary systems are the cosmic norm. The team made their estimate while analyzing planets orbiting a star called Kepler-32 — planets that are representative, they say, of the vast majority of planets in our galaxy and thus serve as a perfect case study for understanding how most of these worlds form. Like the Caltech group, other teams of astronomers have estimated that there is roughly one planet per star, but this is the first time researchers have made such an estimate by studying M-dwarf systems, the most numerous population of planets known. 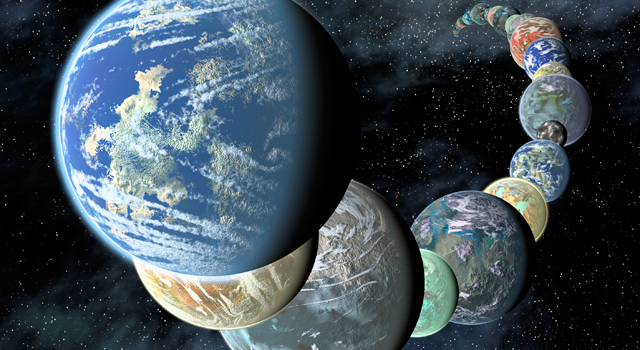 The planetary system in question, which was detected by NASA’s Kepler space telescope, contains five planets. Two of the planets orbiting Kepler-32 had previously been discovered by other astronomers. The Caltech team confirmed the remaining three, then analyzed the five-planet system and compared it to other systems found by Kepler. M-dwarf systems like Kepler-32′s are quite different from our own solar system. For one, M dwarfs are cooler and much smaller than the sun. Kepler-32, for example, has half the mass of the sun and half its radius. The radii of its five planets range from 0.8 to 2.7 times that of Earth, and those planets orbit extremely close to their star. The whole Kepler-32 system fits within just over a tenth of an astronomical unit (the average distance between Earth and the sun) — a distance that is about a third of the radius of Mercury’s orbit around the sun. The fact that M-dwarf systems vastly outnumber other kinds of systems carries a profound implication, according to Johnson, which is that our solar system is extremely rare. “It’s just a weirdo,” he says.